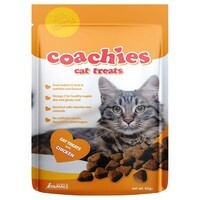 Coachies Cat Treats with Chicken are 100% natural treats with a delicious and highly palatable flavour. Oven baked to lock in the goodness, the treats have been specifically formulated with natural cellulose to help combat hairballs, by helping aid the passage of hair through your cat’s system. Taurine: An essential nutrient helping to support a healthy heart and eyes. Natural Anti-Oxidants: Fortified with minerals from natural organic sources for superior digestibility and absorption. A palatable treat containing quality ingredients. Well liked by my pets.